Last September, Point Defiance Zoo and Aquarium debuted their beautiful new 35,000-square-foot Pacific Seas Aquarium -- home to green sea turtles, hammerhead sharks, a giant Pacific octopus and so much more. Since opening last fall, there have been dozens of new animals added, and now for the entire month of April, you can join in on the celebrations with events inside the zoo and within the community. "We were very proud of the aquarium when it opened on September 7," said Alan Varsik, director of Zoological and Environmental Education for Metro Parks Tacoma. "And we are even more proud today. Over the last several months, our staff has worked hard to include even more animals, and we are more adept at telling the stories of the inspiring sea creatures inside. It's time to celebrate, and we invite the community to rcome and join us." 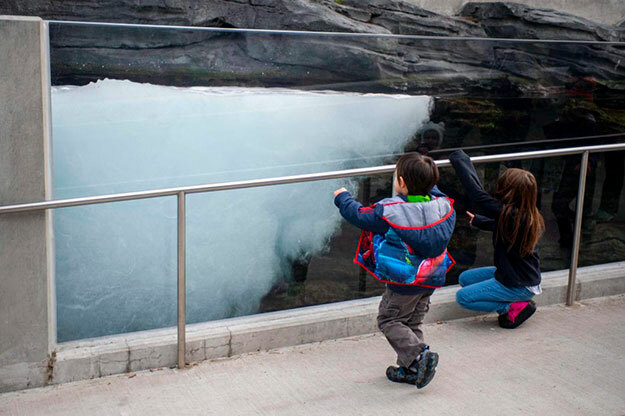 Throughout the entire month of April, visitors to the zoo can experience the wonders of the aquarium with special activities happening every day, free with zoo admission or membership. In addition to the awe-inspiring, massive exhibit that features habitats of the Pacific Coast from the frigid Northwest down to Baja, California, visitors can expect dives, feeds, speakers, stories and exciting weekend lineups. Mondays and Wednesdays, divers can be seen inside the incredible tanks caring for and feeding the animals. Every Thursday, zoo guests can enjoy guest authors, animal story time, and Spanish language story time hosted by students from the Tacoma Science and Math Institute. On Fridays, you can be a part of the art scene, with hands-on art projects as well as local artists discussing jellyfish and more. The weekends will be chalk full of music and the arts, featuring more local artists and filmmakers. Throughout the community, you can get involved with the Turtle Wave, a citywide art project featuring colorful paper turtles. On Tuesdays, local and global scientists speak about issues concerning our oceans today, at venues including Alma Mater, The Grand Cinema and more. For new families to the area, Point Defiance Zoo and Aquarium is the only combined zoo and aquarium in the Northwest. It covers 29 acres of beautifully landscaped grounds overlooking the Puget Sound. In one visit, you can see a range of animals including endangered Sumatran tigers, polar bears, walruses, elephants and muskox; smaller favorites like meerkats, iguanas, otters and puffins; and a plethora of sea animals including six species of sharks, sea turtles, spotted eagle rays, jellyfish, octopus and more. Visitors can also enjoy the antique carousel and camel rides. Whether you have visited the Point Defiance Zoo and Aquarium already or have never been, this is definitely the time to visit. The community of Tacoma takes ocean preservation seriously, and this month you can join in on the celebration of their efforts at the beautiful new Pacific Seas Aquarium. Visiting these incredible exhibits and connecting with the animals at the zoo and aquarium will surely inspire you to help conserve these species in the wild as well.